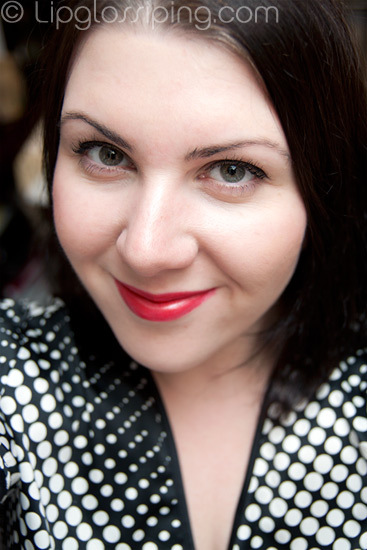 Gosh, has it really been nearly a week since I did a Red Lips day? Time is currently moving far too quickly… that’s what happens when you still have a Christmas tree to put up. 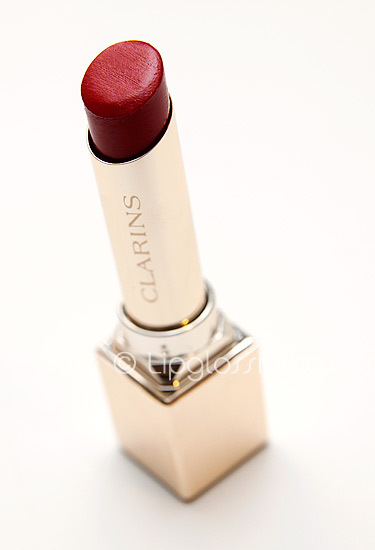 Day 5 is one of Clarins’ new Rouge Prodige long-lasting lipsticks in Fusion Red. If you don’t like your products to be scented… steer clear of this range as that tell-tale lipstick smell has been heavily masked with a lovely (if a bit strong) scent of fig. Fusion Red is a glossy creme with a texture that grips. It has a little less slip during application because of this and takes me longer to apply with a brush than some of the other reds I own but once it’s on, you can wear with the confidence that only a long-lasting lipstick brings. Having said that, I had less teeth transfer issues with Fusion Red than with any other. Is there anything worse than smiling seductively at yourself in the mirror only to notice that it looks like you’ve been chowing down on a couple of wild gazelles during your lunchbreak? Clarins Fusion Red (£16) is a good, solid… long-lasting choice that is particularly unfussy but does need to be kept nearby for a quick touch up when it eventually fades. Such a beautiful shade! I bought it once when visiting the UK and used it up completely in only a few months, but than discovered that this shade is impossible to get hold of in Belgium..